Okay, here's a bit of movie trivia for you. 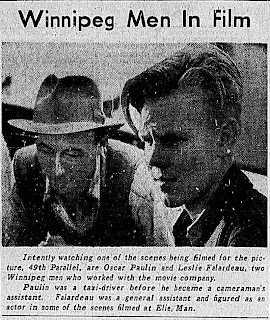 What 1943 Oscar-winning movie was set and had many sequences filmed in Manitoba ? 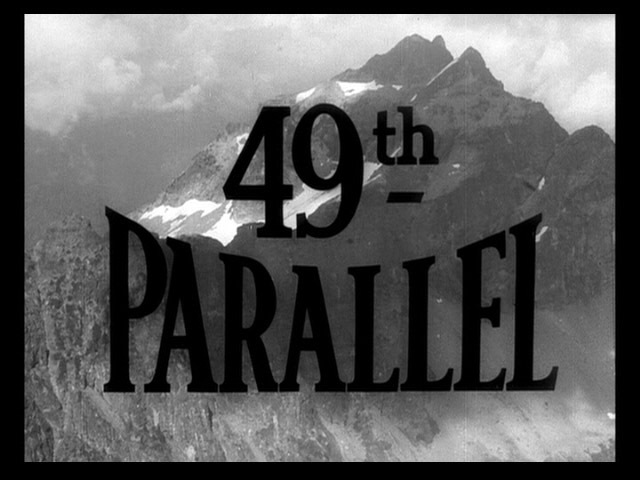 Claimed at the time to be the the first major motion picture set and filmed in Canada, the British production 49th Parallel, (released in the U.S. as The Invaders), had Manitoba aflutter for a few weeks in the summer of 1940. Leslie Howard, Lawrence Olivier, Glynis Johns, Canadian actor Raymond Massey, (former Winnipegger) Carla Lehmann and Director Michael Powell were just some of the Hollywood elite that stayed at the Royal Alexandra Hotel at Higgins and Main during filming. The storyline, in a nutshell: a Nazi U-boat ends up in Hudson Bay and is spotted by officials, German crew ditch it and try to make their way south to the 49th parallel and a still-neutral U.S.. 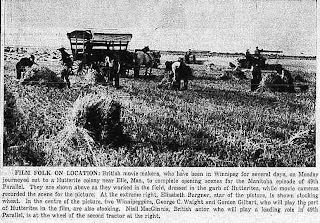 Along the way they encounter good, upstanding Manitoba folk including French fur traders, 'Eskimos' and, of course, Hutterites ! The film shot in a number of Western Canadian locales, including bits in B.C. and Saskatchewan, but Manitoba was home to most of the action. 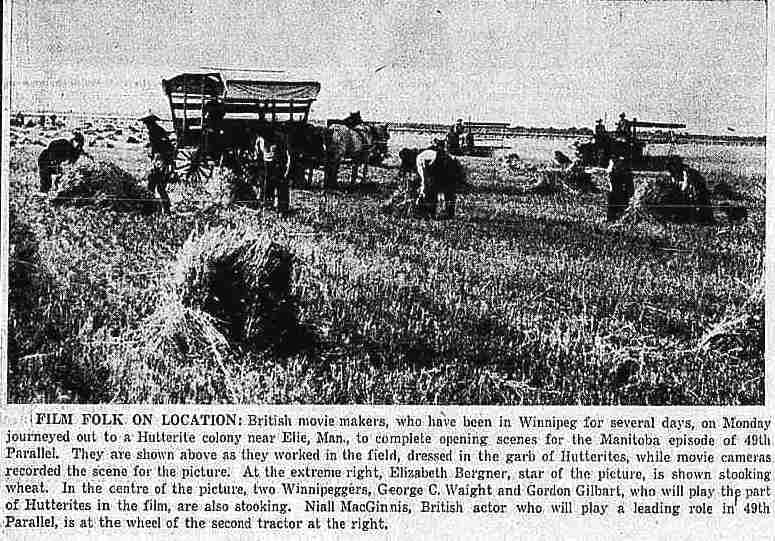 Locations included the banks of Hudson Bay, a Hutterite Colony near Elie and the area around Lac du Bonnet. 49th Parallell was nominated for three Academy Awards in 1943 including Best Picture, the first time a British-made film earned that nomination. On March 4, 1943 at the Coconut Grove of the Ambassador Hotel, Emeric Pressburger won the Oscar for Best Original Screenplay. Not bad considering it was up against the likes of Irving Berlin for Holiday Inn, the Lou Gehrig film Pride of the Yankees and Yankee Doodle Dandy. (The Powell / Pressburger partnership would go on to collaborate on over a dozen films). It was a propaganda movie for sure but, as director Powell told the Tribune, "...all films, all books are propaganda in a sense. Every creative work of art must take sides on some issue". It opened locally at the Capitol Theatre on January 15, 1943 to pretty good reviews from local papers despite the loss of local content. The film still pops up for discussion on classic movie sites. One calls it "one of the best-formulated propaganda movies of the war" and Movie-Film Review.com put it in their top 100 list of WWII movies. - A sad note to the film involves Leslie Falardeau, a local teen with a fascination for photography and filming. He got himself a role as both a camera assistant and a double for Raymond Massey in a few scenes (above). In the time between filming and the film's premiere, he became Sargent Falardeau and was killed in action in October 1941. He never saw his work on the big screen. - The sometimes over-the-top French Canadian accent used by Olivier was taught to him by a Quebecois soldier stationed in London who was assigned to the actor. 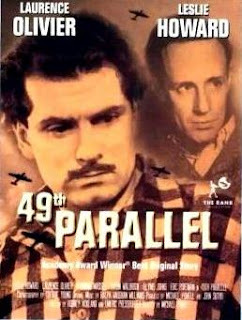 - Leslie Howard was killed when his plane was shot down by Nazis in WWII just a couple of years after making this film. He was a war correspondent for the BBC but rumours at the time were that he was also working in the higher levels of British Intelligence. - Winnipeg-born and raised, though British-based, actress Carla Lehmann came to film scenes as an air stewardess. In the end, though, her scenes were left on the cutting room floor. 49th Parallel full movie ! Saw it years ago. Laughed at how the Nazis just walked their way across the Prairies. But it never occurred to me that they'd have nominated it for Best Picture. I guess the Academy's standards weren't any better then? I guess at the peak of the war it was one of the the 'feel good movies' of the year. I wondered why, if they wanted to get to the U.S., they ended up on a East / West course after leaving Winnipeg. South would have had them there in less than a day ! Ah, the magic of Hollywood !